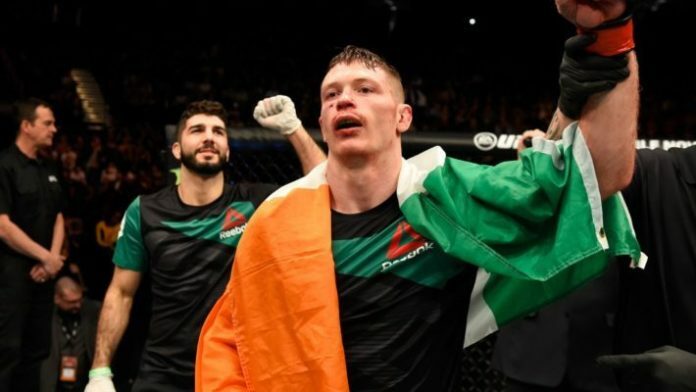 Joseph Duffy is "chomping at the bit" to get back into the Octagon when he faces Marc Diakiese at UFC London next month. Joseph Duffy is “chomping at the bit” to get back into the Octagon next month. “Irish” had a two-fight win streak snapped in November of 2017 when he was finished by James Vick in the first round at UFC 217. However, a rib injury delayed his return, which was originally supposed to take place at UFC Adelaide. Now, Duffy will return to the cage next month at UFC London. “I’m definitely chomping at the bit. With this camp, I just can’t wait to get over there and get into the Octagon. My mindset has changed in a way; camps aren’t always smooth. Sometimes you’re hungry, you’re fed up and you’re body is tired and you can have everything wearing on your nerves,” Duffy said. Duffy will face Diakiese, who is currently on a three-fight losing streak. Diakiese started his career off undefeated. He suffered the first loss of his MMA run in July of 2017 against Drakkar Klose. With two more losses after that, Diakiese is desperately in need of a victory. He’ll face a tough test against Duffy, who will be backed by a friendly English crowd in the O2 Arena. What do you think about Duffy’s comments regarding his Octagon return in March?